1915 – Folk and Blues singer Josh White was born in Greenville, South Carolina. White’s music was very prominent in the 1940’s and his was a personal friend and confidant of Franklin and Eleanor Roosevelt, but the anti-segregationist and international human rights political stance presented in many of his songs were used against him during the Red Scare of the 1950’s, damaging his reputation and his career. 1977 – Clifford Alexander, Jr. is confirmed as the first African American Secretary of the Army. An attorney, businessman and public servant from New York City, he had previously served as the Chair of the Equal Employment Opportunity Commission. He was appointed as Secretary of the Army by President Jimmy Carter. 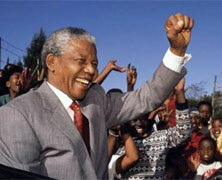 1990 – Nelson Mandela is released from prison. Believing that the system of that apartheid was unsustainable inSouth Africa, newly electeed President F. W. de Klerk announced Mandela’s unconditional release and legalized the African Nation Congress. Mandela and de Klerk were jointly awarded the Nobel Peace Prize and Mandela would later serve as the President of South Africa.